Gil & John T were largely laying down on the job. 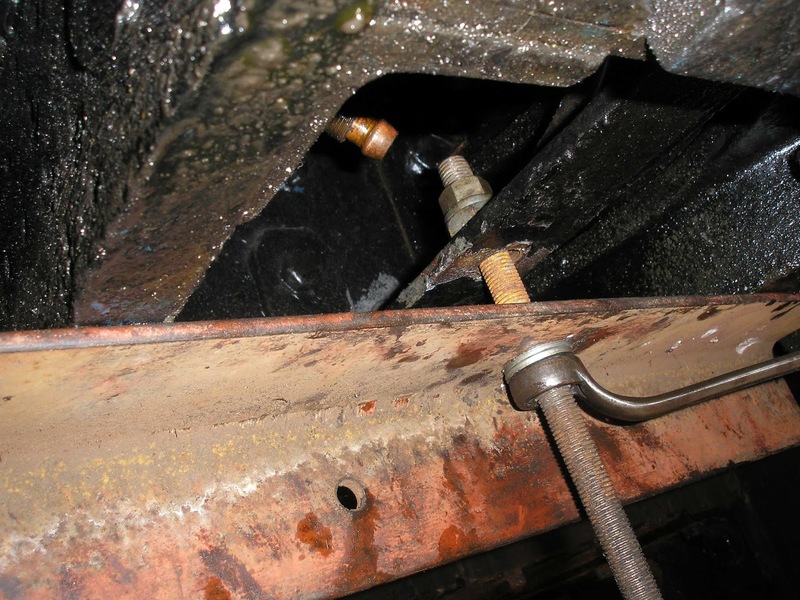 We need to remove a bridge section that holds the pony pivot pin, in order to ream the holes out to a known size; and then make a new pin to suit. Needless to say, this bridge is underneath the loco, which means either laying on the floor and working upwards; or hanging over arbitrary beams and dangling downwards! All morning, they tried to undo first the lock nuts and then (if they'd have got that far) the main nuts. No joy! A flame thrower was considered. JC [Loco Dept] had a go, and even he gave up. I suggested a nut splitter. "Have you got one?" asked JC. Have we as heck! … but a chisel is almost as good! Several chisels later, and they could see some progress … but only then with the assistance of Ian Grant [Loco Dept]. Many thanks, Ian! 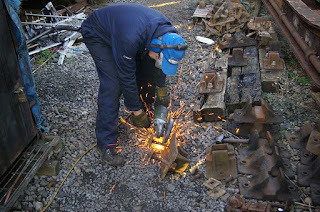 Meanwhile, John G was working on the boot scraper production line. The cafes had sold 9 between them, last weekend, so we did a restock at Todders and John painted five rail chairs that were already in primer coat. At other times during the day, he acted as general gopher assisting me and the nut cracker team. 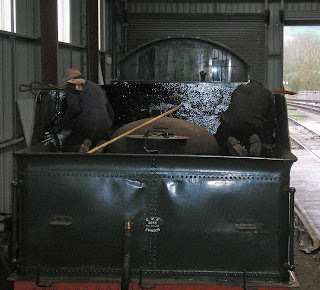 Clive & Ade [Loco Dept] applied a coat of bitumen paint to the rear section of the tender top. A second coat in the coal space is planned for Saturday. I removed the RHS sand box, which enabled me to get the delivery pipe out. I then puzzled over how to stop sand from escaping, as there seems to be a 1 mm gap between the central rod and its surrounding pipe … ample space for the sand to escape through. In the end, Gil decided to order some new pipe of a diameter to match the central rod. Bruce called in (with two eyes now synchronised) and looked for some metal with which to make a couple of discs to replace those that were the wrong sort over the pony lubrication points. He also suggested that, since the bracket that held the (broken) oil delivery pipe is bent, wouldn't it be a good idea to straighten it before fitting the new components? My first thought was to take it off and straighten it, but when I tested the first of four nuts, decided that today was one of those days when all nuts were in refusal mode. So, with assistance from John G, I fabricated a beam-and-screw set up, to pull the bent bracket straight. By going-home time, this seemed to be working. David & Gil spent much of the day measuring every conceivable angle & dimension of the wheelset. Partly to check for any almost-invisible differences; partly to enable Carpo to machine the axlebox underkeeps while the actual axle is away! To that end, Gil had two templates machined to the exact size of the journals on the right- and left-hand ends of the axle. The white metal in the axleboxes was in good condition apart from being too "long" - that is, it protruded further than necessary, which had caused a slight difficulty in lifting the box from the axle. David skimmed the excess off. David & Gil finally turned their attention to that bridge section under the loco, again. Even with the might of JC's arm, those nuts will not move! Applying a bit of heat would probably loosen them, but it is in a very dangerous position. The flame could only be applied from underneath, which is a serious health risk - if anything went wrong, it would be extremely difficult to get out of the way quickly. So, we are still considering the options. Bruce popped in to demonstrate his improved eyesight. I think he's got x-ray vision after his operation. Anyway, he took more measurements for his "homework" concerning the bush in the pony frame and the oil delivery pipes. 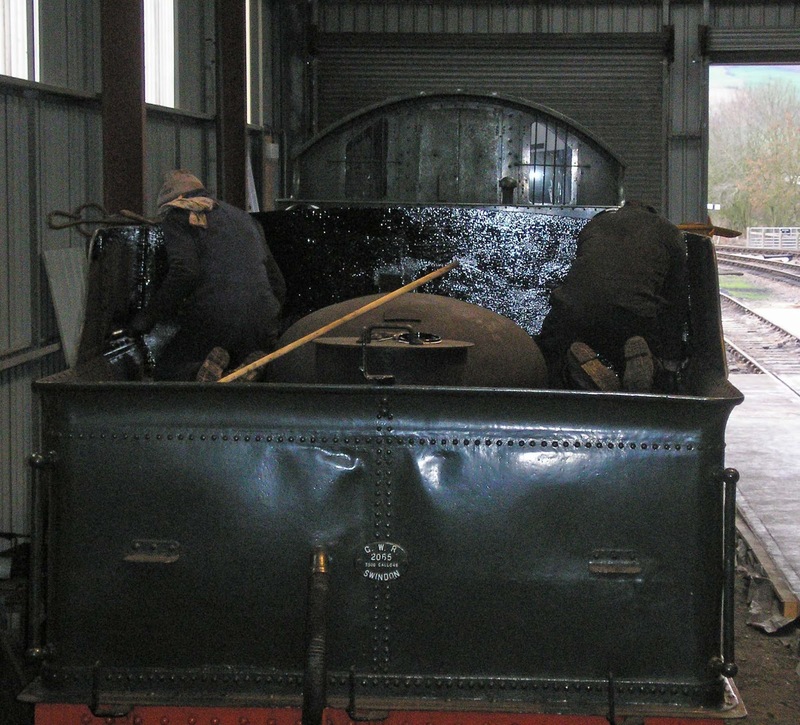 Cliff & Clive, assisted by Donna, [all Loco Dept] applied a second coat of bitumen paint to the tender coal space. On Tuesday, Gil & Geof are taking the pony wheelset to South Devon for truing-up. To prevent the wheels from turning en route, I knocked up a wooden plinth that will spread the load, support the wheel (as opposed to the flange) and support chocks to prevent the wheels from rolling (plus some blocks to prevent the chocks from slipping!). 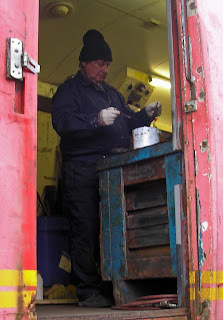 To prevent the journals from rusting, I smeared thick grease all over them (didn't do my gloves any good! ), wrapped cloth round them, then bin liners and taped it all up. Apart from straightening the bent bar that holds the oil delivery thingy, I turned my attention to boot scrapers ... cleaning four rail chairs and painting their bottoms. Because there has been a mini rush on boot scrapers, I popped down to Todders to slap a primer on the tops of the Saturday four chairs. 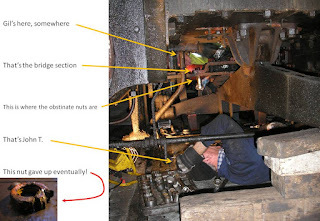 P&O was chuffing up & down, apparently testing out the third cylinder. Previously, it had been running on only two cylinders! I arrived at 08.40 and just managed to get a crimson lake top coat on the LMS chair before Geof & Gil arrived in the GWSR pick-up truck. 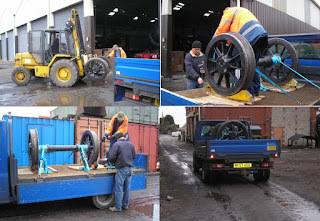 Carpo drove the fork-lift, and lifted the pony wheels onto pallets in the back of the truck. The wheels were chocked and strapped. Even the chocks were nailed down! We certainly don't want the wheels to go a-wandering en route to Buckfastleigh. On the way home, I called in at Winchcombe station, where they had sold 4 boot scrapers … so, back to Todders to pick up four and do a restock! Wednesday 23rd will be a low-key day. I expect I'll pop down and carry on with boot scraper production. Saturday 26th is cancelled as a work day. So, next real work day will be Wednesday 30 December.